Last fall, fires swept through Sugarloaf Ridge State Park in Sonoma Valley. But after the wildfires come the wildflowers. 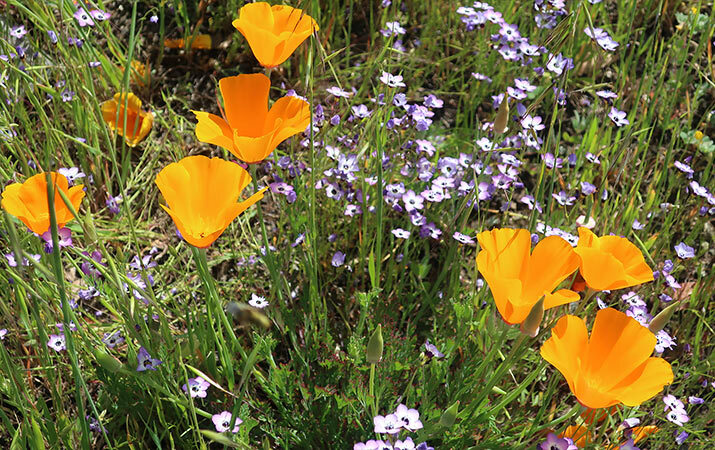 On a weekend in April, we had a picnic and hike in the state park – the hills were covered with colorful wildflowers and lush green grasses. Last weekend, we drove up to California Wine Countrym to Sonoma for the Harvest Festival at Cornerstone Gardens, and shopping at Oxbow Public Market in downtown Napa. Kids will have fun on spring Farm Trails, a weekend visiting working farms in Sonoma County, seeing (and petting) baby goats, lambs, pot-bellied pigs, chickens, miniature horses, and sampling locally produced eggs, cheese, honey.